It’s always great to meet in the room with the client at the very early stages of the event planning process. It’s that time where we can give advice as to how to make best use of the space with regards to screens, staging etc. The room is rectangular. The natural, most obvious layout, would be to have the screen and backdrop at the narrow end. However, FM Global wanted to make their event less formal and bring delegates closer to the action. So we proposed to have the presentation area positioned in the middle of the room, against the long wall. ‘An excellent idea’! An excellent idea maybe, now to design a presentation setting to fit the room perfectly. During our initial meeting we had measured the room to get a good feel of the space we were dealing with. Our technical team then created a floorplan of the Lindbergh Suite to help us understand the event space further. The venue had suggested that space would be tight so our challenge was to make best use of the space by placing multiple screens around the room. 350 guests, seated on round tables, all have to clearly see the screen visuals and hear all presenters. Using the floorplan, we plotted our projection and sound equipment. 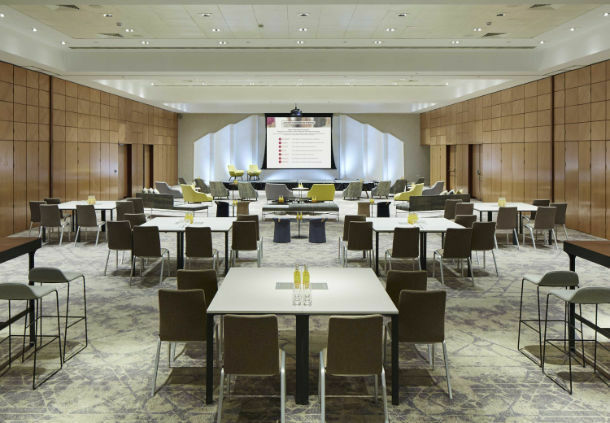 To ensure that wherever you sat in the room you could clearly see the slide content, we proposed the following; a twin screened backdrop, two large side screens and two smaller screens in the far corners of the room. Lastly we proposed to suspend a large projection screen directly opposite the stage for presenters to view their slides during the presentations. A total of 7 screens. Fortunately, the Lindbergh Suite has hanging points in the ceiling. This allows us to suspend our equipment in the ceiling, out of the way, crucial for space saving. One slight snag was the maximum load weight at points in the ceiling were restricted to 200kg. This is quite a restriction in our world when you consider that a projector, with hanging support and lens, can weigh up to 70kg each! Anyway, we’ll come to that later. Floor plan and AV design done, now how will it look? 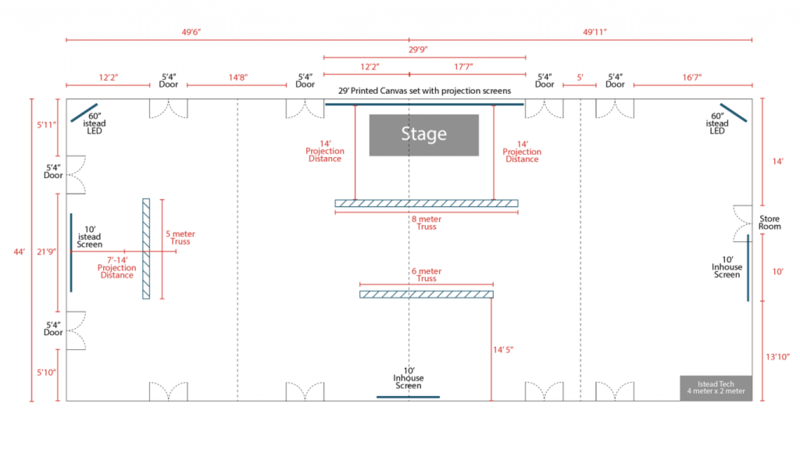 For every event we deliver, we produce a scaled 3D design of the proposed stage set. As they say, ‘a picture paints a thousand words’. It give our clients a complete picture of what we’ll be providing. 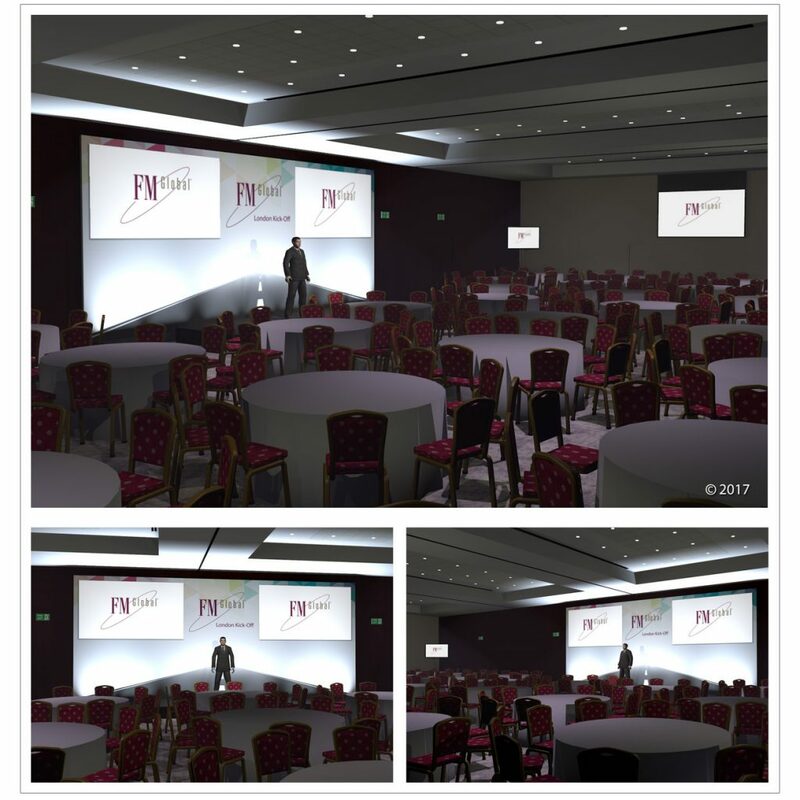 Using FM Global’s event branding we produced a 3D design showing the proposed twin screened backdrop and the additional room screens. Our client loves our designs and we have confirmation! Now, time to make it happen. Our set builders get to work building the backdrop elements. The large backdrop artwork goes to print. Our technical team produce an itemised kit list and allocate our technicians to the event. Our logistics team arrange suitable trucks, vans and crew cars. As we get closer to the event we are sourcing and editing music for presenters, assisting with slide design and formatting. Due to weight loading restrictions in the ceiling at the venue, we make a final visit back to the Lindbergh Suite. Checking the position, weight loading and safe working order of the venue’s hanging points are crucial. These must be tested. When suspending AV equipment in the ceiling for an event we have to ensure we have the right health & safety practices and documentation in place. It’s hard to miss us onsite in our Istead hi-vis jackets, helmets and floor signs. But what you won’t see is all of our health & safety documentation we produce to protect our team, our clients and the event delegates from potential harm. This includes many specific risk assessments, method statements, insurances and equipment assessments. Some venues don’t ask for this information but we provide it anyway. This could be another 10 blogs about how we do what we do during the events but for now, here’s a snap shot of our world. During events we can usually be found at the back of the room ensuring all presenters look and sound great up on our stage. For this conference in particular, we had programmed our LED lighting to change the backdrop colour for every presenter’s presentation to give our set a different look. Our 8 speaker sound system ensured all guests could clearly hear all presenters. 14 presenters, 10 microphones, including our throwable microphone ‘The Catchbox’ and music playback. Plus we supported FM Global’s band at the end of the evening. 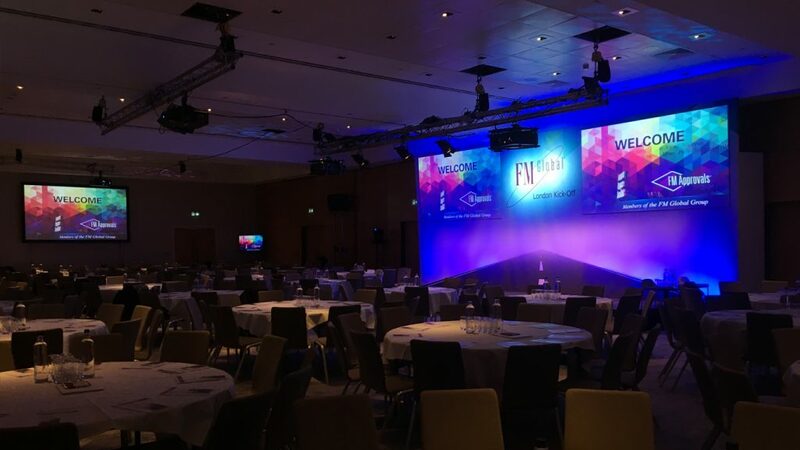 We received amazing feedback from this event, with our client telling us that “the set and lighting were excellent – I loved all the different lighting effects you created, we’ve had lots of comments on the great backdrop!” It’s always fantastic to hear from happy clients, you can read more of testimonials here. Even the venue team commented on our backdrop. “It looked great! We don’t often set up the room this way round but it’s worked really well”.